Join us for an evening of startup talks, food and networking! 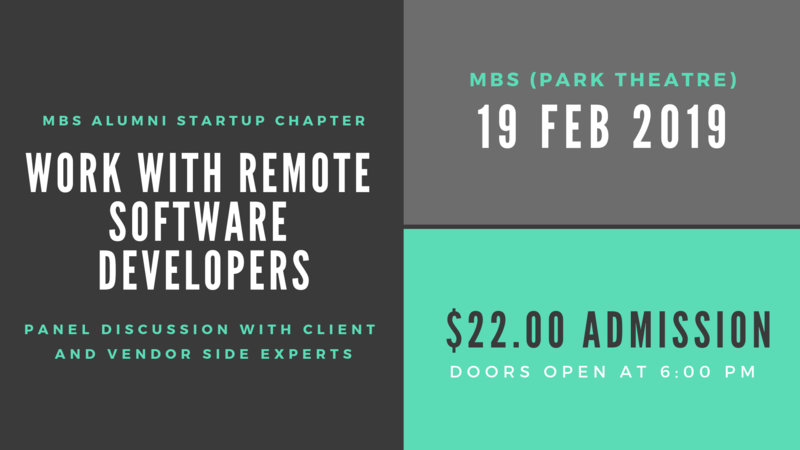 The main theme of the event will be “Working with remote software development team”. All you need to know about working with remote developers: benefits, shortcoming, pitfalls and best practices. We'll have a panel of experts representing both vendor and client side sharing their experience with you. RSVPs close 12noon on Friday 15th February. Please note: This event is being held in the new Park Theatre on the ground floor. Drinks and nibbles will be held in the Hub after presentations. Craig is a senior leader that has experience leading and managing global software product development teams spanning four continents, 8 cities and hundreds of team members. Craig brings deep experience in software product development, organisational design and business strategy spanning 20 years in multiple industries. He has worked in small startups, globally successful product businesses, and leading australian enterprises. Craig also founded LAST conference, which is a conference for cross functional software development teams. A well connected community builder in the Melbourne software development industry. Now Craig heads the Everest Engineering team, a modern software product development consultancy that delivers innovation capability out of India to the Australian tech industry. Ben is a Media Production and Communications Consultant at The University of Melbourne and has been looking after video and web conferencing at the University for over 10 years. He also runs the virtual reality lab within Learning Environments and is currently studying a Master of Music looking at the intersection of music and virtual reality. Alexander has over 20 years of experience managing remote teams of software developers, both client and vendor sides. For 8 years he has managed Altima Web Systems - an offshore vendor specializing in creation of web sites and applications. Business client base includes both established businesses and high growth startups. After graduating from Melbourne Business School in 2011 Alex worked in several Australian businesses that used distributed teams, both on and off shore and run own start-up venture where development was done by remote programmers and designers based in Ukraine and Russia. Since 2014 he runs Magenable, a consultancy that helps Australian merchants to build, improve and maintain their online stores, mainly using Magento as eCommerce platform. Magenable team consists of people based in 6 cities and 3 continents. James is a multi-skilled professional with a wide range of experience including founding TutorTower.com, a startup that connects learners and tutors. He used offshore developers to build TutorTower web application.